Restaurants come and go over the course of time. Some last months, some last years and others have been in business for 50 years or more. 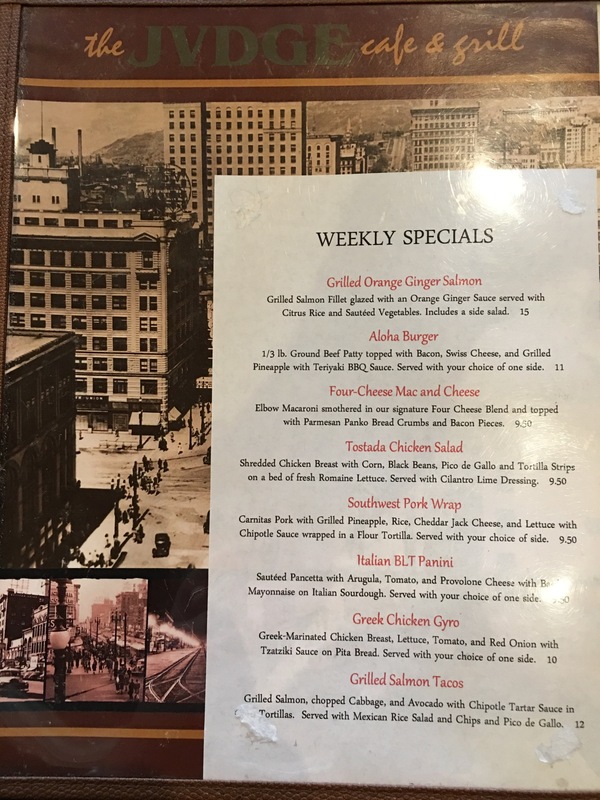 The Judge Cafe, which officially closed up in February 2017, is one that was a local staple for many years in a 110 year old building in downtown Salt Lake City. I’ve been in Utah for more than 30 years now, and have been frequenting downtown Salt Lake City for a good 20 years of that. I first started working downtown in February 2000 and that was my first visit to the Judge Cafe. They are known for their chicken enchiladas, which for a cafe whose specialty is not of the Mexican variety. But my first taste of those enchiladas set the bar pretty high for me. Over the next 18 months that I worked downtown, I ate many a meal at Judge. Sandwiches, meatloaf, desserts of all kinds. I tried a lot of menu items, both static and specials of the day. Price wise, meals were under $10. Eventually, there were $14 and $17 meals, which I steered clear of, mostly so I didn’t end up spending $20 for lunches. Fast forward to February of 2015 when I landed another job working downtown [which is my current job]. My office was literally a 7 minute walk to Judge. And while I’m sure chefs and cooks came and went over that almost 14 years I didn’t work downtown, the meals were always of high quality taste and portion size. So when I heard they were closing, I added more visits their last 20 days. The last day was busy. Lots of people stopping by to pay their respects to their favorite dining establishment, myself included. It’s been well over a year since they shut their doors, and I walk past the building hoping to see a possible return, only to be disappointed. Regardless, I will always have great memories of eating at The Judge Cafe. I’m a big Sammy Hagar fan. Starting with Montrose, then solo, his many years with Van Halen and now Chickenfoot. Have never seen him live and would love to someday. There’s a new tour with multiple dates. 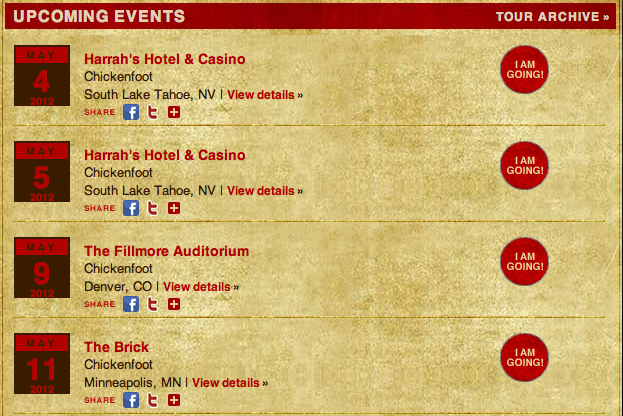 Two shows in Lake Tahoe, which makes sense since there is a Cabo Wabo Cantina there. Then four days later, there is a show in Denver. But no show in Salt Lake City. WTF? As you can see from the map above, the tour buses traveling from the Tahoe show on May 5th go right through Salt Lake City on their way to the Denver show on the 9th. Now I know the band doesn’t have complete control over where they stop. It’s the venue and concert promoters that run the shows and schedule the dates these days. Maybe smaller bands call the shots [maybe, maybe not], but regardless, there is no Salt Lake tour stop for this bus that just so happens to be traveling through Salt Lake. Now if for some reason, between now and the end of April, they read this blog post and think to themselves, “Hey, we have fans in Utah” and schedule a date, then I will retract my rant. Until then, I want to see Sammy, Michael, Joe and Chad Kenny.